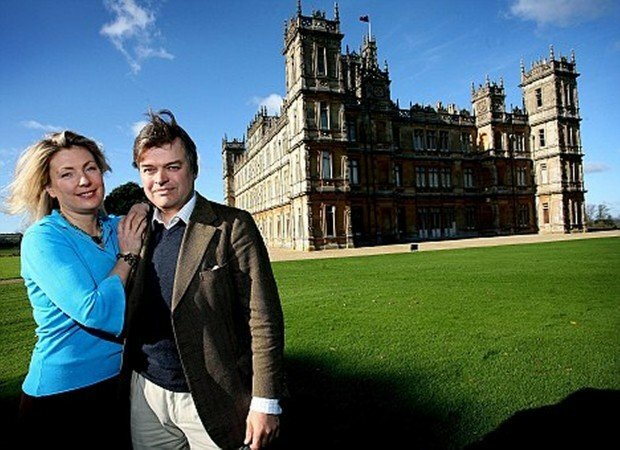 Lord and Lady Carnarvon are the owners of Highclere Castle, where the PBS series "Downton Abbey" is filmed. The Carnarvons are cousins of Bighorn, Wyo., rancher Paul Wallop. Paul and Sandra Wallop of Big Horn, Wyo., are very familiar with Highclere Castle, where "Downton Abbey" is filmed. Paul is a first cousin of the Earl of Carnarvon, who owns the British estate. The couple has visited the castle several times. The cast of the PBS hit "Downton Abbey" third season stands in front of Highclere Castle. Actor Hugh Bonneville as the Earl of Grantham heads the upstairs cast with Jim Carter leading the estate's staff. Maggie Smith, Elizabeth McGovern and Shirley MacLaine also star. 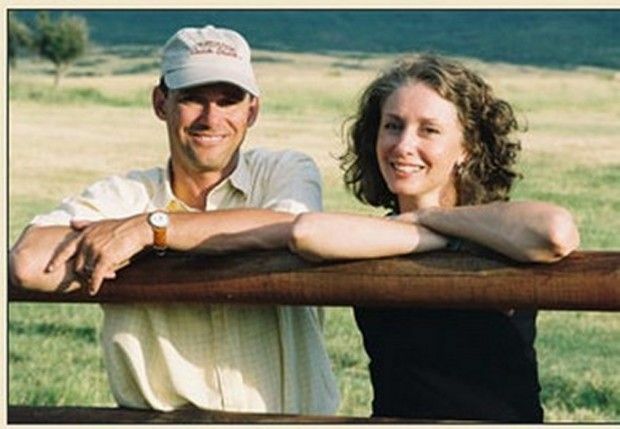 The series runs Sunday nights at 8 p.m. over Montana and Wyoming PBS stations. John Warren, is the queen’s racing adviser. As far away in miles and lifestyle as “Downton Abbey” may seem, there’s a close connection between northern Wyoming and the stately castle where the smash hit PBS series is shot. Wallop’s great-grandfather, Oliver Henry Wallop, was the son of the Earl of Portsmouth, a British peer. Oliver Wallop was one of many “remittance men,” younger sons of British families who wouldn’t inherit a title or land, moving to Montana and Wyoming in the 1800s. The men were subsidized by payments, or remittances, from home. Oliver first bought land near Birney, Mont., before buying the Canyon Ranch at Big Horn in 1889. He also served in the Wyoming State Legislature. When Oliver’s older brothers died without heirs, Oliver inherited the title of earl and returned to Great Britain. His grandson Malcolm Wallop, Paul Wallop’s father, was born and raised in the United States and become a U.S. senator from Wyoming. The former Republican lawmaker died in 2011. Malcolm’s sister, Jean, who was born and grew up in Wyoming, married the man who would become the seventh Earl of Carnarvon and owner of Highclere Castle. The family is known for more than just a beautiful estate. The fifth Earl of Carnarvon financed work by Howard Carter that led to the discovery of King Tut’s tomb in Egypt in 1922. Carnarvon was present with Carter when the tomb was first opened. That’s not all the family is famous for in Great Britain. Jean Wallop Herbert’s husband, Henry, was Queen Elizabeth’s horse racing manager and close friend until he died in 2001. Jean’s daughter, Carolyn, now operates a thoroughbred racing farm at Highclere, and her husband, John Warren, is the queen’s racing adviser. Jean, 77, the dowager countess of Carnarvon, continues to live near Highclere but remains a U.S. citizen and often returns to a Wyoming home she owns, much to her relatives’ delight. Sandra said that her own husband shares those same down-to-earth qualities. During at trip to the United States in 1984, Queen Elizabeth stayed with the Wallops in Big Horn. She went out walking at the ranch every day and hoped to see wildlife, but the large contingent of security guards following her everywhere scared the animals off, Paul Wallop said. One day, the queen put on Jean Wallop’s coat and scarf and slipped out of the house by herself so she could catch a glimpse of the animals. The Wyoming Wallops have visited Highclere Castle several times. Paul spent the summer after graduating from high school working on his uncle’s Highclere farm. Later, he spent time at Highclere learning about driven pheasant shoots from the estate’s longtime game keeper. Wallop brought that style of hunting back to the Canyon Ranch, where it was used by guests for several years. In driven pheasant events, the birds are flushed from the ground and shooters take aim as the pheasants are flying overhead. The current earl and his wife, George (nicknamed “Geordie”) and Finoa Herbert, have been to the Wallops' ranch. A PBS program just before the first installment of the third season of “Downton Abbey” aired Sunday told the story of Highclere Castle and its current owners' struggle to keep such a massive structure going. To come up with the huge sums of money needed for maintenance, the earl has opened the castle to tours, weddings and other private events. The Wallops are delighted with the global success of the chronicles of Lord Grantham and his family and staff, which has brought more business to Highclere. It’s also been fun for the Wallops to see a house so special to their family vividly displayed. Paul and Sandra had a party at their Wyoming home Sunday to gather friends to watch the season opener of the “Downton Abbey” series. Although the Wallops have visited the rooms featured in the television program, their familiarity didn’t distract from the excitement. “We oohed and awed like everyone else must have,” Sandra said. “Downton Abbey” can be seen over Montana and Wyoming PBS stations Sunday nights at 8 p.m.